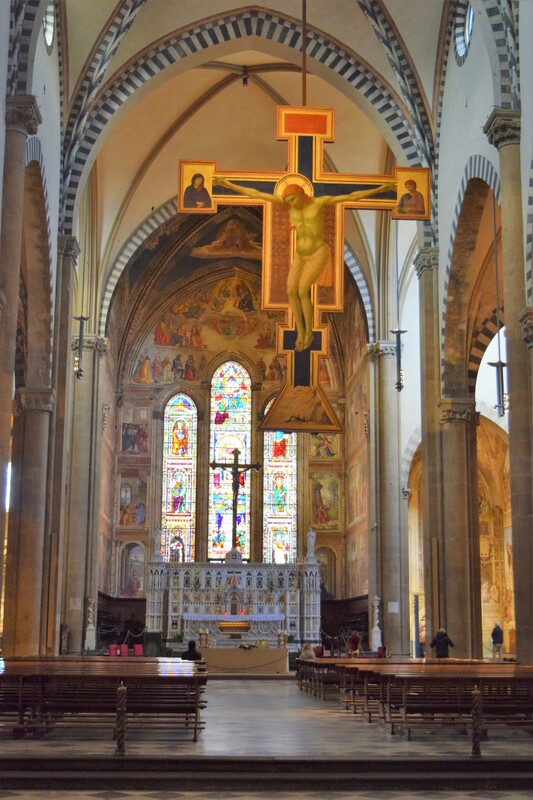 Santa Maria Novella is a beautiful church in Florence, Italy and is just a few steps from the main railway station named after it. The church has a magnificent facade inlaid with green and white marble. The price of admission includes the church itself with its amazing paintings, the museum and the grounds which you should stroll through and admire. Along the side aisles you can find all the paintings hung. 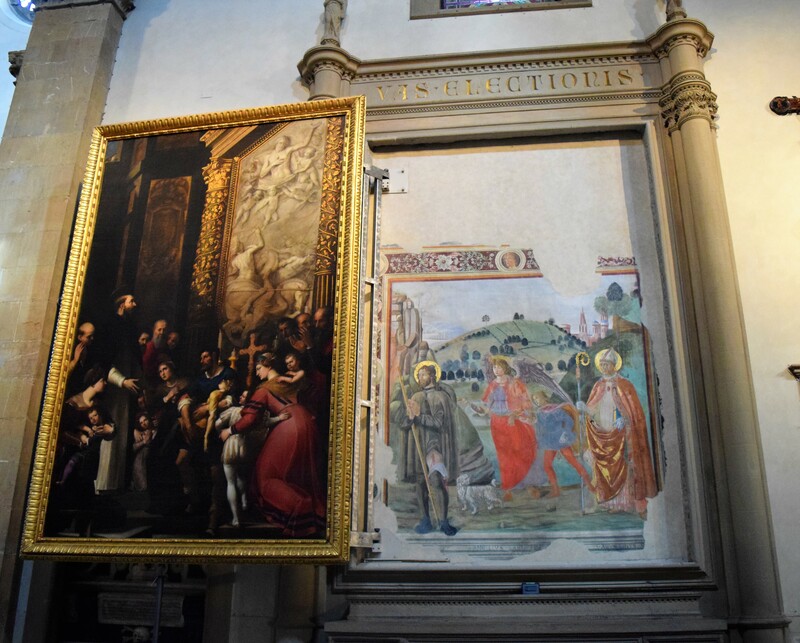 What is so unbelievable is that they are displayed on hinges so you can see the frescoes behind each of the paintings. These frescoes were there long before the church acquired the paintings. I love how they are displayed! The museum is composed of two cloisters of the ancient convent, the Spanish Chapel and the large refectory. The Green Cloister has frescoes by Paolo Uccello with scenes from the Old Testament. Unfortunately being outside, some frescoes are in bad shape but can still be admired. 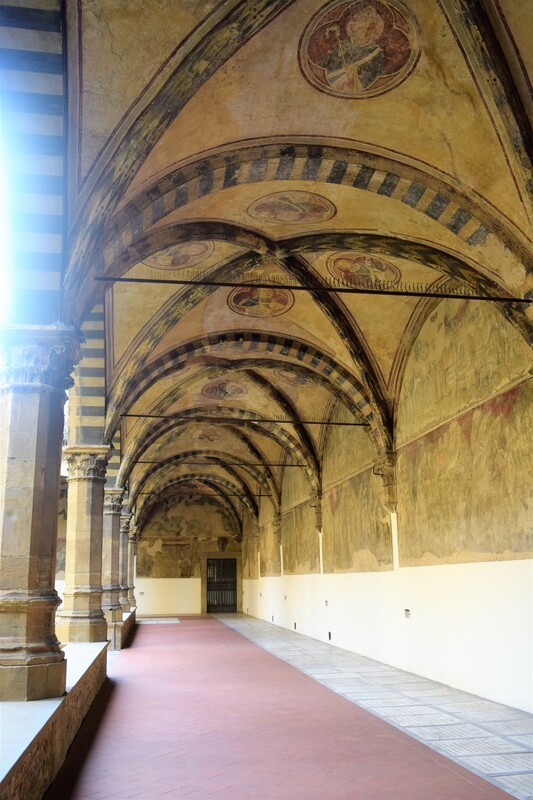 Below are frescoes from the Refectory and are magnificent! Gary shows you perspective of how large this frescoe truly is! The other cloister, the Grand Cloister, has been home to the Marescialli school since 1920, and closed to the public. The Grand Cloister is quite a large area with 56 arcades surrounding the internal courtyard corridor. This piazza is heavily patrolled by Africans trying to sell you bracelets. They ask where you are from, pretend that they are interested in your story and slip on a smelly bracelet that they of course want money for. They are nice but quick with their approach and can be found mainly in this piazza.